We all know money is important and what I love most about this little piggy bank is how it isn't only about "hey honey, put your money in the piggy bank" it's about a life lesson that will hopefully stick with them forever. 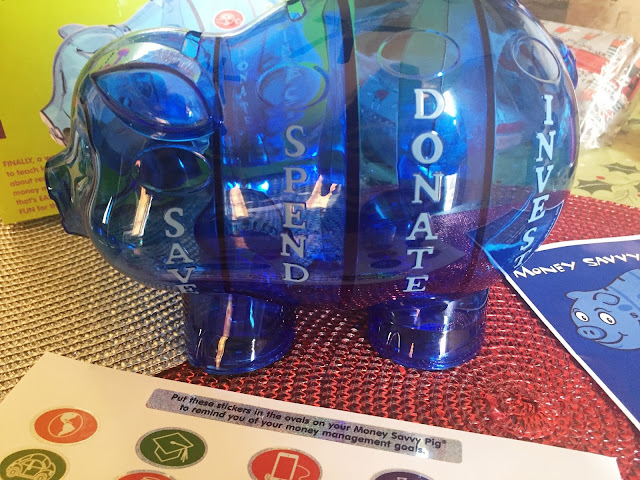 We all know we are going to spend money on the things we want and when we get older we might even invest it or during tax time donate some of it for the write off so why not teach our kids now how to handle money so in their future they aren't struggling the way we are. 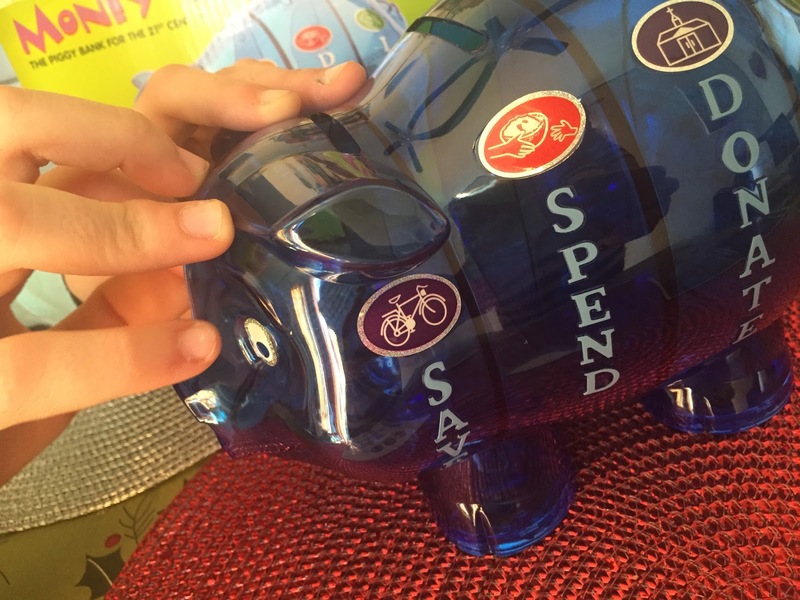 Meet the piggy bank for the 21st Century - the Money Savvy Pig. 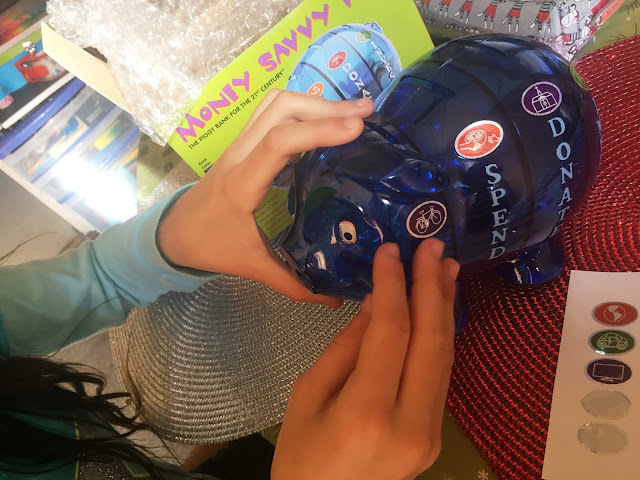 This unique bank helps teach kids the basic money choices: SAVE, SPEND, DONATE and INVEST. 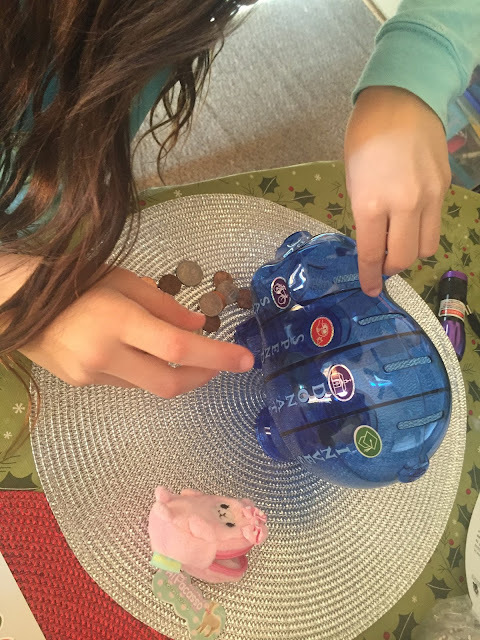 Kids can set goals for each money choice, put money into each of the 4 separate slots/tummies and watch their money grow in each money choice chamber/"tummy". When they are ready, they can easily empty each individual chamber through a unique foot on the bottom of the bank. 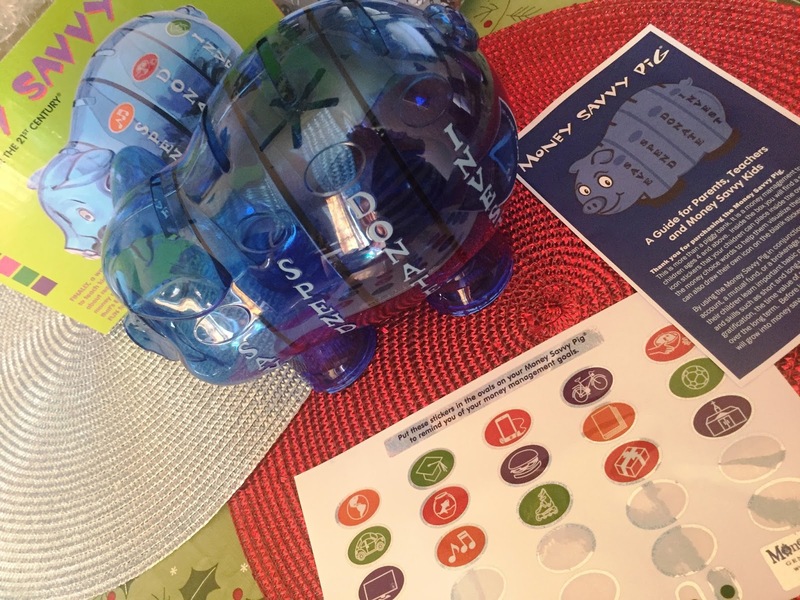 Each bank includes eye stickers, goal-setting stickers and a guide on how to get started. What I loved about spending this time with Goddess was how excited she was to learn about what the other two words on the bank meant. The words at 10 that she doesn't know but now is as good a time to learn as any and what a fun way. The bank comes with eye stickers, she choose one brown and one green. It also comes with stickers for each separate slot. We took time to decide on which stickers to put on the bank. She asked what donate is and I explained that it is when we give something to someone else. Like at Christmas when we donate new toys to the church's Christmas party or when we give our change to the box at McDonalds for the Ronald McDonald House but that on this bank it would be up to her. She could donate to whatever she wants. Our town just lost our Pastor so since we have been talking about him she has decided to donate to the Church. Investing I told her is something we are putting away for the future. I told her that her father and I have very very small retirement funds that we invest in and she chose to invest in education. She wants to save for a bike and save to take me and her brother out for McDonalds (sweet). This little pig was a great way to have a long conversation about where money comes from, earning money, saving money and not spending what you don't have so that one day maybe she will be debt free instead of living paycheck to paycheck. 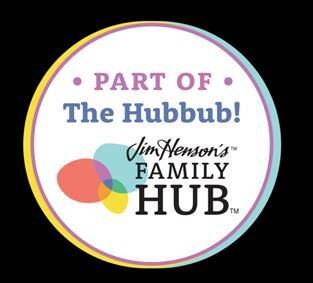 This is a perfect resource for families and while the site says kids under 11. 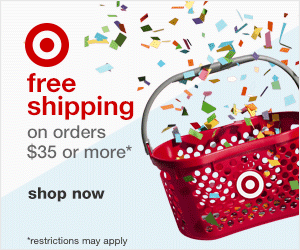 I believe it is great for all teens. My nephew is 17 and I think this would help him realize that Mommy and Daddy are not his personal bank. It's time to get a job kid! She emptied her change purse immediately! The bank is not only set up with dividers in each section but each section has it's own slot to deposit and it's own opening at the bottom to retrieve the money. 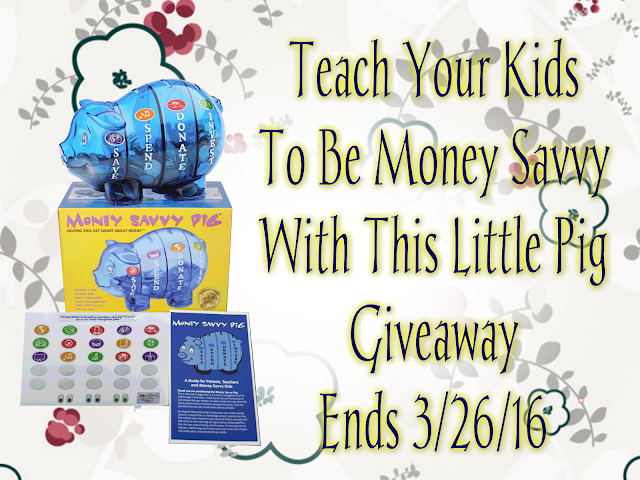 The Money Savvy Pig is available in translucent blue, green, pink and purple. For more styles visit www.msgen.com. how do you enter? I see nothing to fill out? 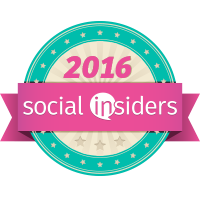 VickieC, I just checked and the entry form is there. It may be taking longer on your system.